The Board of Trustees, Faculty, Staff and Students of Hocking College invite you to our Annual Commencement Ceremonies on Saturday, May 11, 2019 at the Hocking College Student Center in Nelsonville, Ohio. Students may invite as many people to the ceremony as they wish, as the event does not require a ticket. A formal graduation announcement to be shared with friends and family can be found here. Members of Phi Theta Kappa can earn their graduation stole through their chapter or purchase one at ptk.org. Members of Alpha Mu Delta can purchase or rent a graduation stole from their chapter. A reception following the commencement exercise will be held in the lobby of the Student Center. The deadline to order caps and gowns for Spring 2019 graduates is Friday, April 5, 2019. Obtain your cap and gown, available in a variety of sizes at no charge to graduates. Caps and gowns must be ordered through www.keyplusinc.com. Select "College Gown Selection" on the left side of the page, then select "Hocking College Cap and Gown Order Form" on the right side or visit the Hocking College Order Form directly. 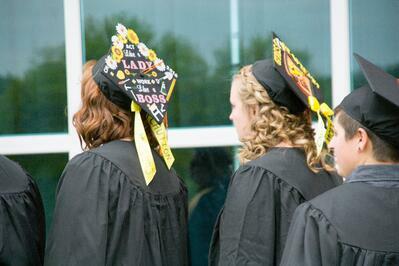 Pick-up your cap and gown at the Hocking College Bookstore. Your college account must have a zero balance in order to pick-up your cap and gown. Reception: Graduates and graduation guests are invited to attend a Sweet Success Reception in the lobby of the Student Center immediately following the graduation ceremonies. Flowers: To pre-order flowers call the Nelsonville Flower Shop at 740.753.9502. Flowers will also be available in the Student Center Lobby before the ceremony. The Spring 2019 graduation deadline is Friday, February 8. If you will finish all course requirements by the end of Spring 2019, please apply for graduation through WebAdvisor. Who is eligible to walk at the Commencement ceremony? Students who apply for graduation may walk in the ceremony for the term in which they have had that application approved. For example: Autumn applicants, who have been approved, will walk in the Autumn graduation ceremony. Students are required to order a cap and gown via the online form. The order form will be available after the application deadline each term. The cap and gown is free for students graduating. What color is the Cap and Gown for Graduation? Every graduate will wear a black cap and gown. The tassel color will vary by major. Graduation is the process of receiving your diploma and having your degree awarded to you. You must apply for graduation even if you do not plan on attending the Commencement ceremony. An application is necessary to verify that you have completed all the requirements before a degree/certificate is awarded. The application is free, and must be approved by your school dean/faculty and the Registrar's Office. What must I do to graduate during a given term? Complete all classes required for your degree. Visiting your advisor is recommended. Complete all work, with final grade posted on transcript. Submit official transcripts for any transfer credits. Complete an Application for Graduation. What if I don't meet all the requirements by the end of the term? You will receive a letter letting you know that your application was denied. You will then need to work with your Academic Advisor to determine your next steps. Applications are valid for the original graduation term indicated only. If you are denied, you must reapply for the following term. What if I get an Incomplete (I) grade during my last term? You must complete the class before you are allowed to graduate. If you apply prior to completing the coursework, your application will be denied. Once the course is completed, you will then need to reapply for the term in which graduation applications are currently being accepted. I want to walk in Commencement, but I need to finish some classes in summer. Can I still walk in the Spring ceremony? 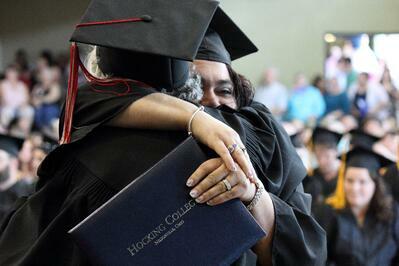 Hocking College now offers commencement ceremonies each term. If you still have courses to complete for summer, you are welcomed to participate in our Summer Commencement Ceremony. Students will participate in the ceremony in which they applied for graduation. I've met all my requirements already, but I have not applied for graduation. What term should I apply for? How will I know that I have graduated? A preliminary evaluation will be completed prior to the end of the term. Students will receive a denial letter if your application is denied or a preliminary approval letter if you are on track to finish. Any student who receives a denial letter must work with their academic advisor to discuss the reasons. Preliminarily approval of a degree means that at the time of review, the students will meet all required courses by the end of the term. Students must complete all requirements satisfactory. Submit an Application for Graduation by the deadline listed below. Currently enrolled students must complete the Graduation application through their WebAdvisor account. All applications received on or before the deadline will be processed for the current term. All applications received after the deadline will be processed the following term. Hocking College will only process graduates once a term. Processing Degrees, Diplomas and certificates takes 6-8 weeks after the end of the term. Diplomas are not given out at the Commencement ceremony. You will not receive your diploma/certificate if you owe a balance on your account. All diplomas are mailed to the address listed on the Application for Graduation form. If you do not provide a valid address, your diploma will be mailed to the preferred address on file. I have two degrees. Will I get two diplomas? Yes, you will receive a separate diploma for each degree. What GPA do I need to receive honors? To receive an Honors degree, you must graduate with a 3.5 GPA or higher. What should I do if I receive an error message stating I am not eligible to submit a graduation application online through WebAdvisor? I lost my diploma, how can I get a replacement?